Livingston is a small farming town located in the Central Valley of California about 100 miles due east of San Francisco. It is the site of the original Yamato Colony, founded in the early 20th century by Japanese immigrants originating from Wakayama-ken and Chiba-ken. Once settled, they began extensive farming activities, eventually founding the Livingston Cooperative Society in 1914. Painstakingly, these settlers cleared land to plant grapes and peaches followed by almonds, eggplant, sweet potatoes, melons, tomatoes and asparagus. The Yamato Colony is the only known Japanese community in California to develop without a Buddhist temple, not because of any particular mission, but more likely due to the community’s efforts to blend into the existing European-American community that surrounded them. Two separate Livingston Methodist churches, one “Japanese” and one “White,” merged in 1977, forming the Livingston United Methodist Church. This is when Mochitsuki, the rice pounding ceremony, began in the sleepy little town. 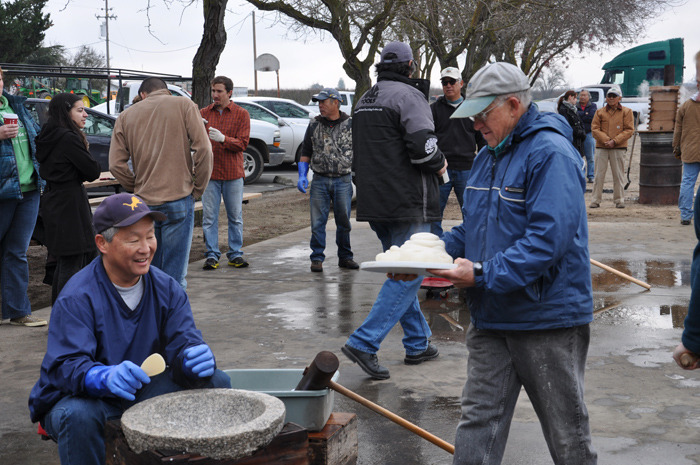 Every year, the community comes together during the week between Christmas and New Year to steam, grind, pound, and shape balls of glutinous rice known as mochi. This year, 500 pounds of dry sweet rice were cooked, pounded to a smooth paste, and formed into approximately six thousand individual mochi balls. 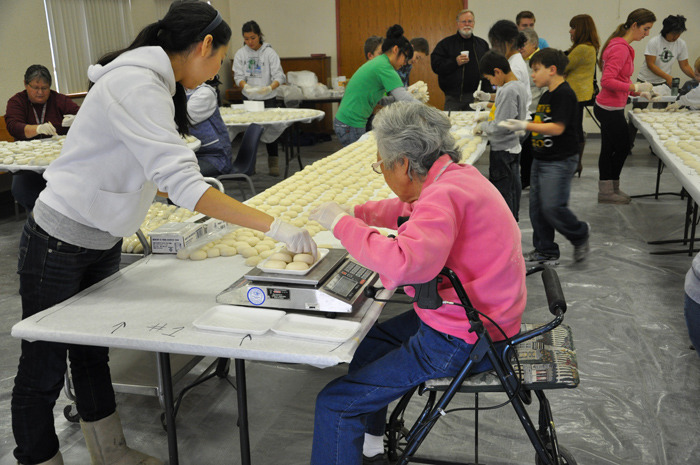 Attended by around 100 people of all ages and origins, Mochitsuki is one of the community’s most important fundraisers and cross-cultural and cross-generational activities. Mochi is an important element in the celebration of the Japanese New Year. It is common that two balls of mochi topped with a clementine are placed on altars. This is called kagami mochi. Mochi is also eaten during the New Year’s meal in a soup. Children especially like to eat mochi that has been formed into beautiful round confections, often filled with sweet red bean paste or around flavored creams and sweet fruits. The glutinous rice is soaked overnight. 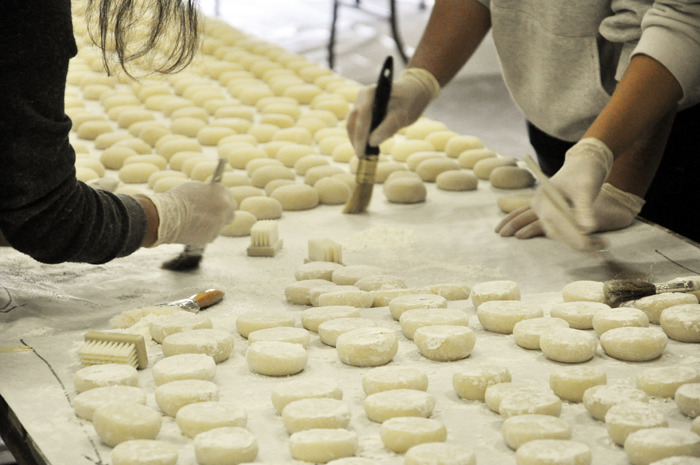 These mochi makers started out with 500 pounds of dry sweet rice and began cooking at 8 am. 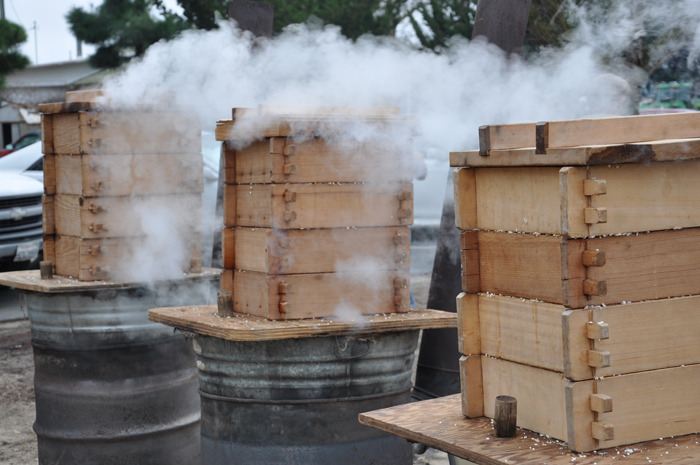 Two large “scoops” of rice, about five pounds, are steamed in traditional wood steamer frames. The frames, piled four high, are cooked over kettles converted from oil drums. 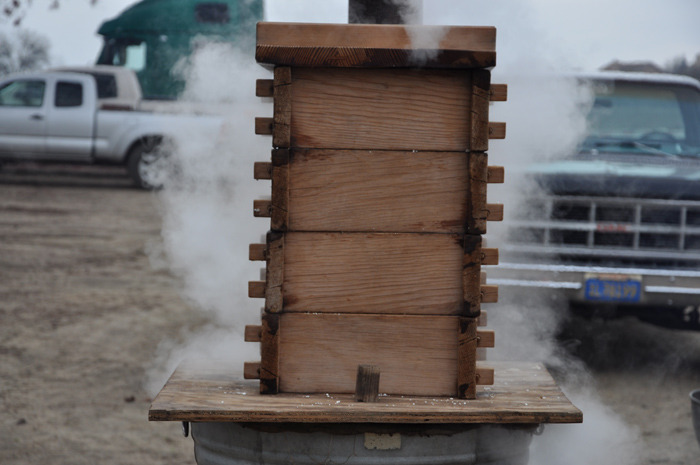 These makeshift steam kettles are fired with almond wood from the local orchards. The rice is steamed for 35 minutes, then run through a grinder. Mochi can be made directly, without grinding, from the whole grain rice. But for the last few years, the younger generations have embraced “new” technologies; the Livingston group has been using their grinder for a few years now. Smooth and sticky, the mochi is taken from the usu to the “finishers.” The women and children gather around vast tables to pinch, roll and dust mochi balls. Care must be taken since the mochi develops a crust as it cools. The finishers make plain mochi balls with some and pinch the mochi paste around sweet fillings for others, all the while catching up on family news and community gossip. The finishing room in Livingston is the large church hall and is filled with four generations, all working seamlessly together. When all the mochi has been portioned and cooled, the weighing and sorting begins. Bags of pre-orders are prepared and the cash table is set up. Slowly the congregation shuffles through picking up their mochi order. Everyone takes the opportunity to catch up on the holiday latest and to grab a snack and a cup of coffee in the volunteer kitchen.